Lately I’ve been foregoing gringo grocery stores for ethnic stores (exceptions to this are Trader Joe’s and Fresh & Easy). These grocery stores consist of 99 Ranch, Nijiya, North Park Produce and now I can add Northgate Mercado to the list. I recall reading about the construction of Northgate Mercado in Barrio Logan last year and it wasn’t until Paul and I attempted to leave the convention center after comic-con one day that I was reminded about the stores. There are several Northgate Mercado stores in the San Diego area but it was the Barrio Logan location that caught my eye. It’s in the shadow of the Coronado Bridge right off Ceasar Chavez Blvd. and among some new development in the area. Its orange and green logo catches your eye. My only regret during the visit is using my cellphone to take photos. But most grocery stores don’t allow photography inside the premises and my hard-to-miss DSLR would only attract attention so please bear with me on some pretty crappy photos. Inside there is a carniceria (meat department), panaderia (bakery), hot food area advertising comida casera (homemade food), etc. It’s a lot to take in, especially on the first visit. There’s also a lot of Spanish signage but not enough to confuse non-Spanish speaking shoppers. I could have spent a good hour perusing the aisles while attempting to take photos with my phone but I managed to walk away with a few items. 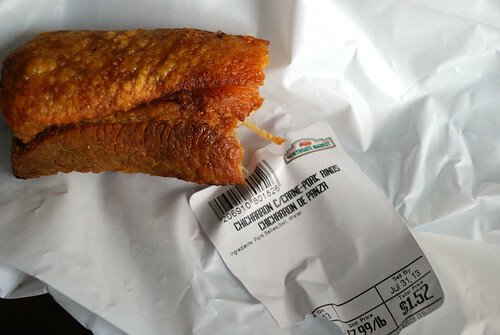 Don’t tell me you have enough restraint not to nibble on chicharron. 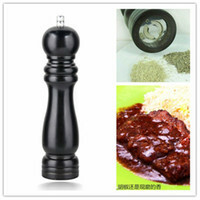 This piece has a lot of pork still attached and there are varieties without any meat. The .19 pound piece was only $1.52 (it’s $7.99 lb.) I bought as a snack and it was enough to keep me full. 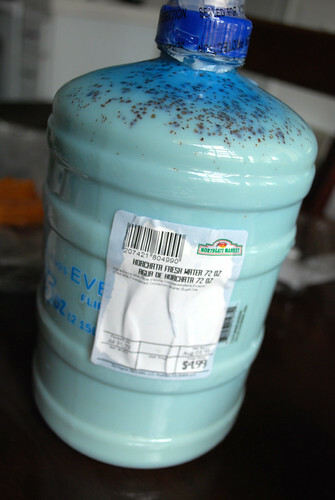 This is possibly the best horchata I have ever had. The secret ingredient is condensed milk so erase any illusions that this is low-fat. It’s an awesome deal at $4.99. Be sure to keep this upright when transporting home because the top leaks. And I couldn’t very well leave without something sweet. 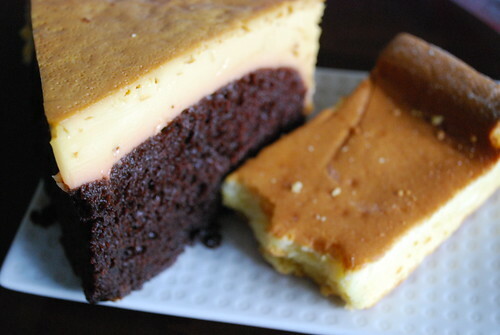 The slice of choco flan ($2.99) caught my eye. Who needs frosting on a chocolate cake when you can have flan? The pan de queso ($1) is nothing like American cheesecake. It’s less sweet and dense but equally delicious. 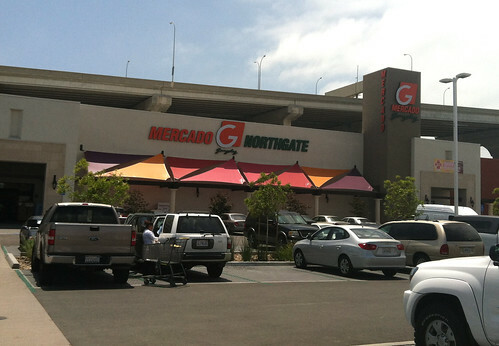 There are several Northgate Mercados in San Diego County; please check the website for more details. Remember the old Safeway on Coronado Ave (near the Wing?). That is now a Northgate (formerly El Tigre). I love their takeout food and readymade guacamole. I’d rather go to ethnic grocery stores. They have better food and depending on the store, really good deals on the produce. Cool! That’s great to know. I agree about produce prices plus there are products you don’s see any where else. I love this place. It’s the closest big grocery store to where I’m living now. I took photos of it shortly after it opened with intent to blog it but I have yet to get around to it. The carnitas there are DELICIOUS. Some of the best I have that weren’t my fathers. So much so that for Father’s Day, I bought carnitas with a few bits of pig ears and chicharron from this very market and my Dad was in heaven. Now that’s an endorsement! Wow… now that’s a compliment! I can’t wait to go back and stock up on more groceries from here. I didn’t know that these markets existed. The variety of Mexican sweet bread has me sold. You definitely need to check it out but bring restraint. It’s hard to walk away with a few things. Glad to see you finally made it to Northgate! It’s now my favorite store!